Sebastien’s work has consistently drawn from astronomy and space exploration, extending his fascination with stars as a gateway to infinity into his cosmic abstraction paintings. Recently, he was particularly struck by the beauty of the photographs taken of comet 67P / Churyumov-Gerasimenko by space probe Rosetta, finding them miraculous in their ability to capture the elusive confines of the human reach. The stark desert landscape of the comet contrasts with the advanced technology of the vessel and summarizes in one snapshot the profundity of life; every element in our bodies once comprised a star, and we now strive to return. The photographs show where we are in relation to where we come from, with this distance representing the complexity and marvel of intelligent life and evolution. Sebastien’s most recent sculpture thus marries mathematics with chaos, architecture with mineral formation, and technology with nature. 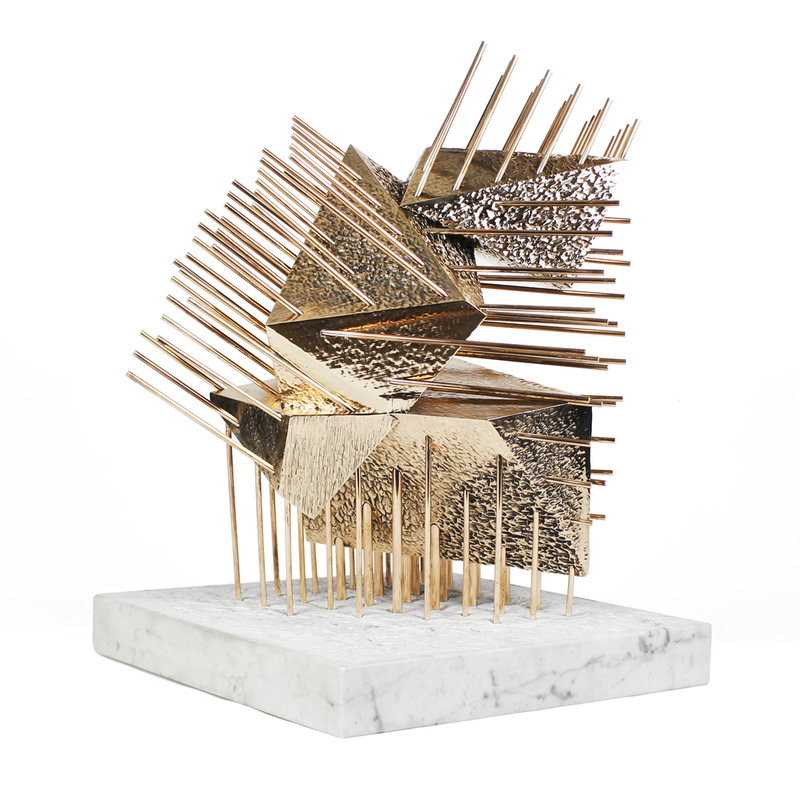 "Rendez-Vous Sur Orbite", in English “Space Rendezvous”, mixes elements of space exploration, mineral geometry and architectural construction to form an elevated cluster of four geometric blocks, extending into matrices of bronze. The name “Space Rendezvous” refers to the orbital maneuver during which two spacecrafts, one of which is often a space station, arrive at the same orbit and approach to a very close distance. The same rendezvous technique can be used for spacecraft “landing” on natural objects with a weak gravitational field, e.g. one of the martian Moons.